This article is written by the Revd Daniel Davies. Since 2001, he has served as Priest-in-Charge of Christchurch, Harris, in the Western Isles. How did we come to this? How this church came to change Christ’s teaching is the story of every fall into heresy. It begins with a truth; heresy then takes it, expands its scope and meaning until other truths are abandoned and the church falls into error. That is how good, intelligent, thoughtful people are led astray. Heresy is a powerful word with a very specific meaning. The church has two kinds of teaching: dogmas and doctrines. The dogmas are simple statements written by the early church which set out and defend the truth of who Christ is. These are set out in the Apostles Creed, the more detailed Nicene Creed, and the Chalcedonian Definition: which states that Christ is fully God and fully man. All these statements – dogmas, can be written on a single page. They define for every Christian who Christ is, what Christianity is and what a Christian must not deny. The doctrines are quite different; they vary from church to church, and they each explain many different ways that Christians can celebrate, live and understand the truth of the dogmas. The doctrines and the books that explore them will fill libraries. As church understanding evolves and grows the doctrines can change and develop too. Such a change only becomes heresy when a development of doctrine undermines a dogma; when it leads to a denial of who Christ is. That is the line that the Scottish Episcopal Church has now crossed. It began as a civil rights campaign for gay marriage. It began with the truth that every person is equally loved by God. These joined in a Christian revisionist movement to deliver gay marriage in church. Other truths were dismissed and in the single minded pursuit of their goal the Scottish Episcopal Church was led astray. The problem is not civil rights. The problem of heresy is specific to Christ himself. The line is crossed because in order to achieve their goal, this church has been willing to change Christ’s teaching given by him in Matthew 19: 5-6. Here he says three things: that God created us men and women, that a man will marry his wife and the two will become one flesh, and that what God has joined together let not man divide. This is Christ’s word, that the church follows and blesses as Holy Matrimony. If Christ is fully God (as well as fully man) his words transcend time. If Christ is the truth, the meaning, measure, personification of all truth; then to move, add or take away from his words is a questioning and ultimately a denial of his divinity. We cannot change Christ’s words, except on the basis that he is not God, but just man. Otherwise who would dare? The sad truth is that for many in the western church, Jesus is not God, but is just a man. Much of the teaching in western churches has drifted away from the traditional faith. Over many decades the direction of travel has been to radically re-envision the faith, and at its heart is the denial of the full divinity of Christ. One of the leading revisionists is the American theologian Marcus Borg, who has spoken at Scottish Episcopal conferences. He teaches that the creeds (which state the dogmas) are something to be in conversation with, not to be believed, that Christ is to be understood as a Hebrew mystic, a spirit person, and as one of the various spirit people – religious leaders, who come to us throughout history (name your own list), but in essence is just a man. Revisionist teaching has been moving through liberal theological colleges and has captured much of the leadership in western churches. It is this theology that finds itself echoed in the change in the Scottish Episcopal Church’s doctrine of marriage, because Christ’s teaching no longer fits the revisionist’s worldview. It is based on the assumption that since Christ is in essence only a man; it follows that he was limited to the understanding of his own time and that now with our greater knowledge we have the duty to change his teaching. They have claimed that this teaching is only a development of doctrine, but such a development is not legitimate if it undermines a dogma, and no dogma is more precious than the divinity of Christ. If Christ is not God we are not saved. If Christ is not God we cannot receive him in Holy Communion. If Christ is not God there are no sacraments, no church, no Christianity, just make believe. But Christ is God. His church will stand and heresy will fail. The Scottish Episcopal Church has fallen, it just hasn’t realised it yet. It is a fallen branch from the vine that will wither and die like every heretical church before it. Christ is The Way, The Truth and The Life. 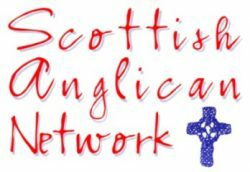 The way ahead for faithful Anglicans in Scotland is to embrace the possibilities offered to us by the consecration by the GAFCON Primates of Bishop Andy Lines. Founded on Christ’s truth, this offers new life for bereft orthodox Anglicans in Scotland.